One thing I hear often from readers is a request for quick, simple meals. While it’s sometimes nice to pull out all the stops, easy meals that can be thrown together quickly are essential for daily cooking. 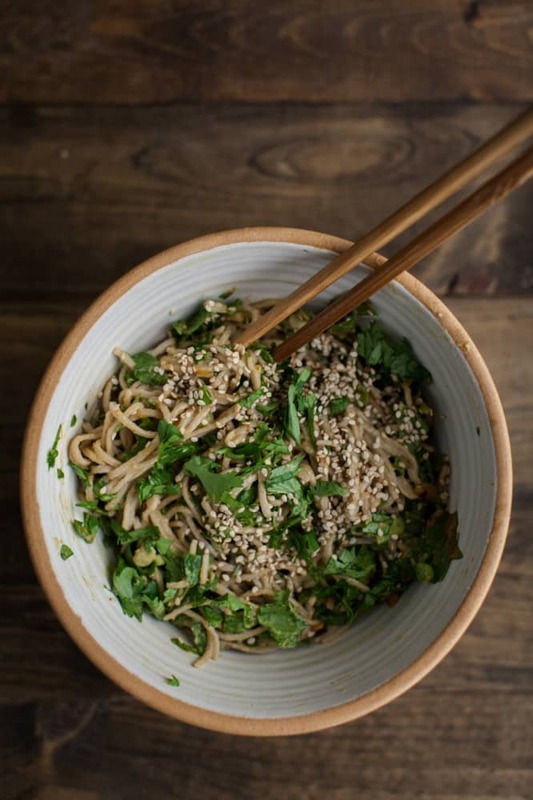 This noodle bowl is my go-to lunch/dinner for one recipe. 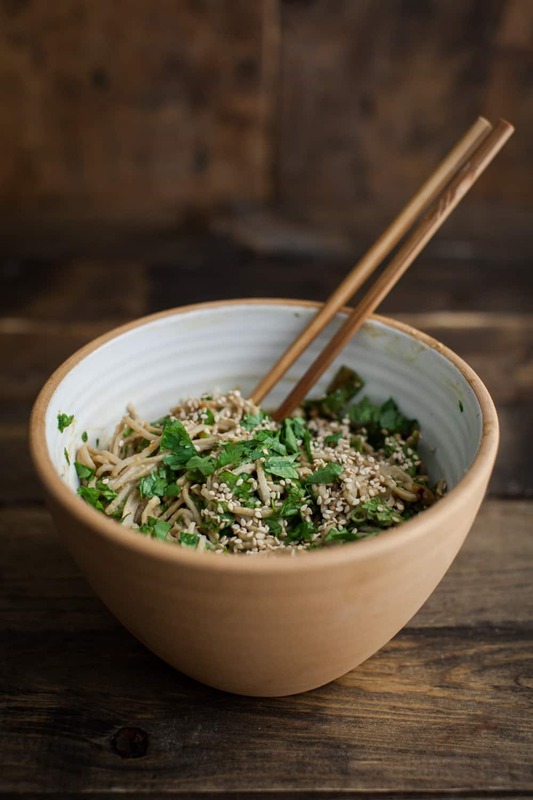 It’s a variation on the brown rice noodle bowl I posted a couple years ago but this version limits the amount of cooking (only the noodles) and relies on the hot noodles to help soften the spinach slightly. There are a few things you could change up, like adding steamed broccoli. These spinach soba noodles are wonderful cold and the sauce sticks well to the noodles. Try playing around with the peanut sauce as well. Some days I’ll add an extra large scoop of ginger while other days it’s an extra pour of soy sauce. Really, this bowl is more free style than exact recipe. 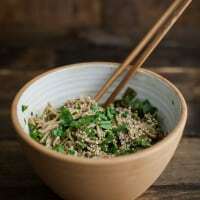 These spinach soba noodles come together for a meal in about 15 minutes (or less, depending on how fast you move in the kitchen!). This is exactly the type of dinner I love best when it’s hot and steamy out! So quick and full of refreshing vegetables. Besides, who doesn’t want an excuse to eat as much peanut sauce as possible? Sooooo…. I totally just made this as soon as I saw it 🙂 Definitely quick and easy, and love the peanut sauce!!! Thanks Erin! Perfect for weeknights! Spinach and peanut sauce are so tasty together too. Looks wonderful! Great stuff, Erin! I’ve got a couple of small eggplants in the fridge which I’m thinking would add to this dish nicely, have you tried that combo? That looks so good!! Delicious and I believe (and hope) simple enough for me to be able to make it haha! Love this Erin! 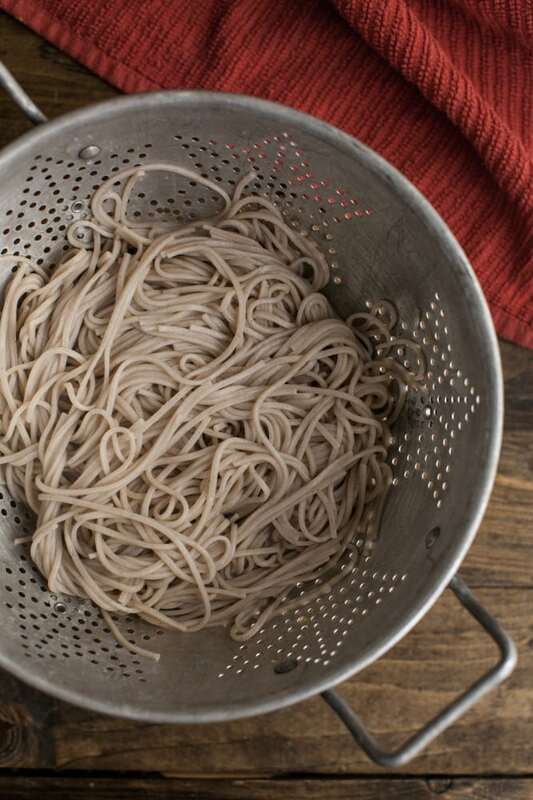 Peanutty soba noodles are my favourite! This does look like a great lunch or single lady dinner 🙂 I love anything with peanut sauce, so this is definitely being made soon! Yes! I’m in the simple meal ideas camp… especially during the summer. This recipe looks fantastic – oh how I love anything with peanut sauce 🙂 Thank you!! Gorgeous recipe! I love the combination of the rich soba noodles with peanut sauce. I think I just love peanut sauce, to be honest! That stuff is drinkable! 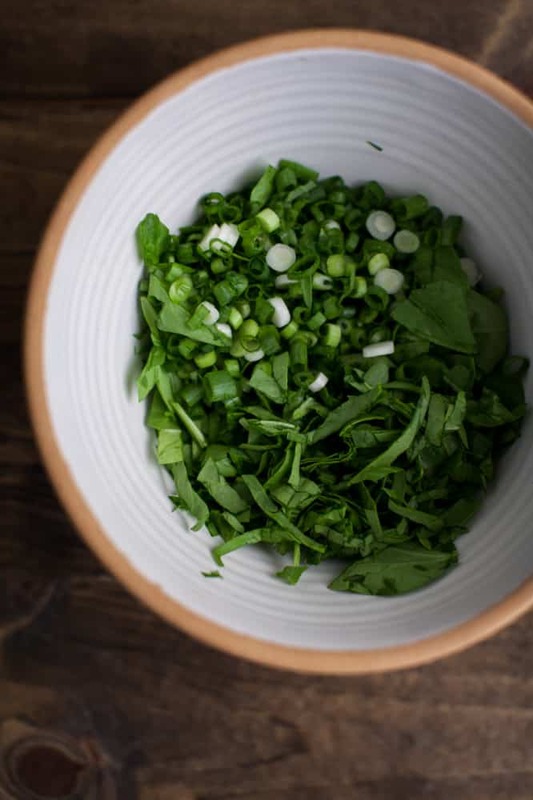 The scallions would perk up the whole dish. Pinning and making. And, I’m also pretty in love with that bowl and star-patterned colander -rustic yet adorable! I looove soba noodles! Where do you get yours? 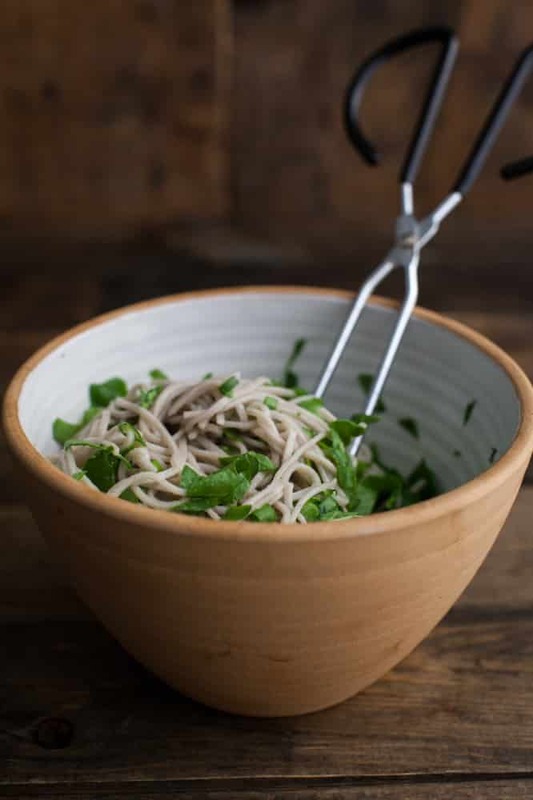 With the impending semester upon me, this recipe will be a great one for travel lunch/dinner 🙂 Soba noodles are so delicious and your photos are always so impeccable! Thank you! Clean, crisp, simple and yummy! Thanks for sharing this lovely recipe. Love the simplicity and quickness of this dish! Pinning for a weeknight dinner! for a day to day stuff, I am all for 30 minutes or less meals – this sounds perfect. I made this dish on Sunday and it was delightful. My scallions were pretty beefy and a little over powering, so I could have used less, but otherwise a great dish. Fast and really filling with lots of good flavor. Ooh – that looks delicious. I love the idea of a peanut sauce. What an absolutely beautiful bowl too! I can’t wait to cook this dish! I love the simplicity of it and love, love, love the spinach! I think it would be delicious the next day straight from the fridge as well. I just made this dish and it is so good! My boyfriend is going to love it. Thank you! Sadly I can’t have any nut butters, do you have other ideas for a quick sauce? Thank you so much!